I just spent the loveliest six weeks at home. It’s the first time this year that I’ve been home for more than a few weeks at a stretch and boy did I need it. I leaned hard in to the rhythms of being home: cooking dinner, evening runs, couch time with Trevor, grocery shopping, sleeping in, long yoga sessions, learning a new sonata on the piano. I have always been a creature of habit and a bit of a homebody – a few weeks of chill is a type of bliss for me. Travel makes the pleasures of being home that much sweeter. Since getting home, I turned 29. Trevor turned 29. I got my first pair of glasses, and was amazed by the clarity of trees in the distance, and of our TV. The fruit trees bloomed and faded in a whirlwind few days. Our garden turned from a patch of dirt with a handful of lonely daffodils into a plot bursting with green potential. The first rose opened, and the irises are brilliant in full bloom. Every day we get a few perfectly ripe strawberries – whatever the pesky robin doesn’t get overnight. We had a rainy mother’s day brunch by the fire that turned into a brilliantly sunny walk in the woods an hour later. My best friend from high school got married in the Boston Public Library on a chilly grey day filled with love and champagne. It’s a beautiful time of year to be in Boston and I’m so grateful to be home for it! For each of our birthdays I made a cake. For mine, a vanilla sponge with strawberry jam and strawberry buttercream. 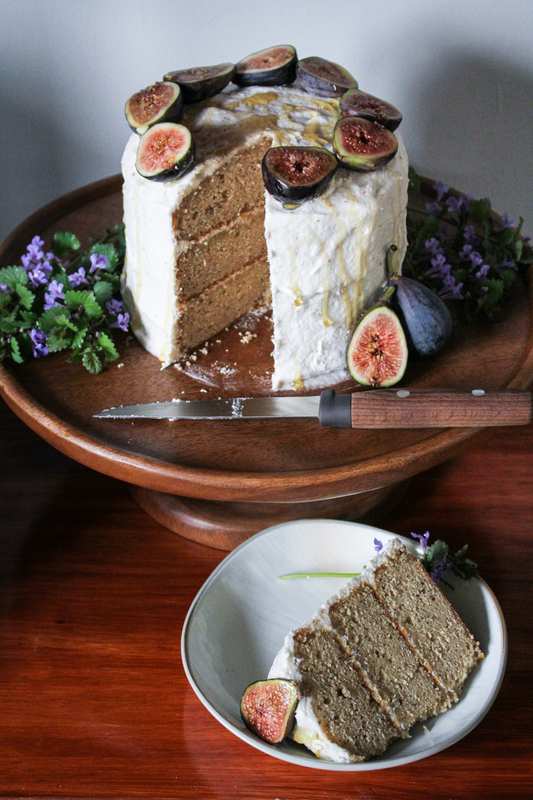 For Trevor, an earl grey sponge with honey-fig buttercream. Both cakes disappeared without a problem, but Trevor’s earl grey cake was truly special. 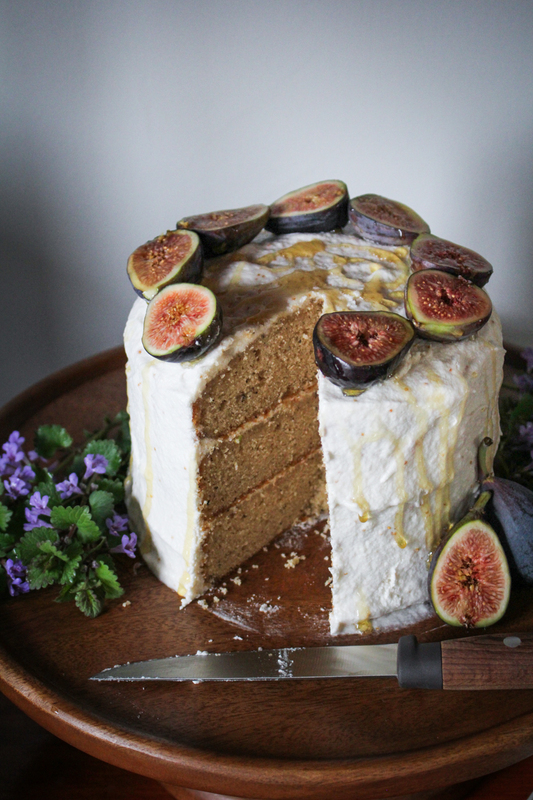 Pretty cakes are not my strong suit (a buttercream expert I am not) but this tasted so good that I covered it up with fresh figs and flowers and snapped a few pictures so I could share it with you. I can’t take credit for either recipe component, only the combination. 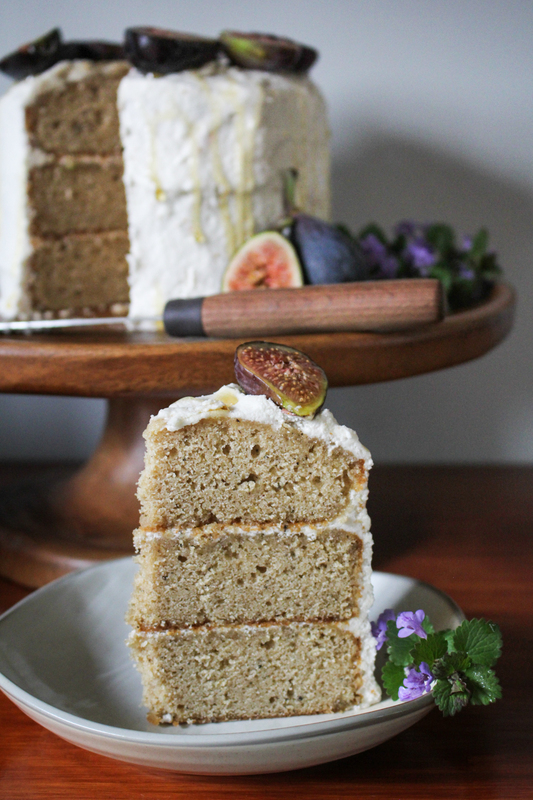 The earl grey cake is from Liv for Cake and the Italian meringue fig buttercream is from Sticky Spatula. I struggled a bit with the buttercream splitting after a night in the fridge, but the flavor was beautiful and paired perfectly with the cake. If you have a special occasion coming up that calls for subtle flavors and a bit of refinement, I highly recommend this cake! 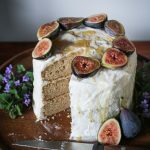 A beautifully-flavored and moist Earl Grey Cake topped with an Italian Meringue Buttercream flavored with fig jam. Elegant and refined for a celebration. This makes a 3-tier, 6-inch cake. Cake recipe adapted from Liv for Cake. Frosting recipe adapted from Sticky Spatula. Microwave the milk on high until steaming, about 60-90 seconds. Add three of the earl grey teabags to the milk and let steep for 10 minutes. Remove the teabags, pressing any extra milk out of them with a spoon. and discard the teabags. Set earl grey milk aside, allowing it to come to room temperature. Add the butter and the sugar to a mixer and beat with a paddle attachment on medium until it is pale, creamy and very smooth, about 2 minutes. Turn off. Add one egg and beat on low just until the egg is incorporated. Repeat with the remaining eggs, one at a time. Scrape the sides of the bowl with a spatula as needed to ensure that all the ingredients are being evenly mixed. In a medium bowl, whisk togther the flour, baking powder and sea salt. Cut open the remaining earl grey tea bag and pour the tea into the flour mixture. (If the tea is in very large pieces, pulse it in a coffee grinder before adding to the flour). Whisk to combine. Add 1/3 of the flour mixture to the batter and beat on low just to incorporate, about 30 seconds. Add 1/2 of the earl grey milk and beat just to incorporate, another 30 seconds. Repeat twice more, ending with the final 1/3 of the flour mixture. You should have a smooth, spreadable batter without any lumps. Preheat the oven to 350F. Butter the bottom and sides of three, 6-inch cake tins. Cut a round of parchment paper to fit into the bottom of each tin and use this to line the bottom of the each tin. Divide the cake batter between the tree tins, using a spatula to evenly smooth the batter out. Batter should fill a little more than half-way up each tin. Bake the cakes in the preheated oven for 40-50 minutes. They are done when the cake surface springs back when lightly pushed down, and a toothpick inserted into the center of the cake comes out clean. Remove from the oven and let cool for 10 minutes, then run a knife around the inside of each cake tin and invert to release the cake. Let cakes cool completely on a cooling rack before frosting. Wash and quarter the figs, removing and discarding any remaining stems. Place in a saucepan with 1/2 cup of the sugar and the honey. Gently mash the figs with a wooden spoon. Bring to a simmer over medium heat. Simmer, stirring often, until the figs are soft and jammy, about 15 minutes. Strain the jam through a mesh strainer, setting the thinner jelly aside to add to the frosting. 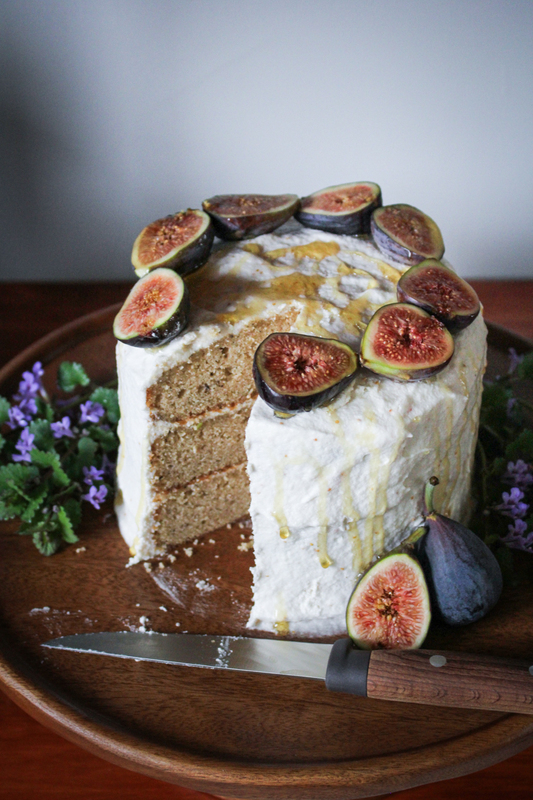 Save any remaining fig chunks for another purprose (or just eat them!). Place the remaining 3/4 cup of sugar in a saucepan. Add the 1/4 cup water and stir to fully moisten the sugar, taking care not to get sugar water on the sides of the pan (which may cause the syrup to crystallize). Bring the sugar water to a boil over a medium-high heat. Clip a candy thermometer to the side of the pan and bring the sugar to 240F. As soon as it reaches this temperature, turn off the heat. Add the egg whites to the bowl of a mixer. Beat on high until they are white and frothy and form soft peaks. At this stage, continue beating while very slowly and carefully drizzling the hot sugar syrup down the side of the bowl into the egg whites. Pour in a thin stream until you have used all the sugar syrup up – egg whites should be glossy and hold stiff peaks. Continue beating the egg whites on medium speed until it is room temperature with no warmth felt through the bowl. At this stage, begin adding the butter 1 TBS at a time. Butter should incorporate into the frosting smoothly. Once all the butter is incorporated and the frosting is smooth and glossy, add the fig jelly to the buttercream and beat until incorporated. If you’re having trouble with the buttercream, try reading some of the tips in this article. If necessary, use a serrated knife to cut any domed top off of each cake so that both the top and bottom of each cake is flat. Use a dab of frosting to stick the bottom layer cake to a cake stand. Smooth a thick layer of buttercream on top of the bottom layer of cake, then top with the next layer of cake. Repeat until you have three layers of cake with two layers of buttercream between them. Smooth a thin layer of buttercream all around the cake. If the cake is crumbling into the frosting, pause here and refrigerate the cake for 30 minutes to set the crumb coat, then continue frosting so that you have a smooth, thick layer of buttercream on all sides of the cake. 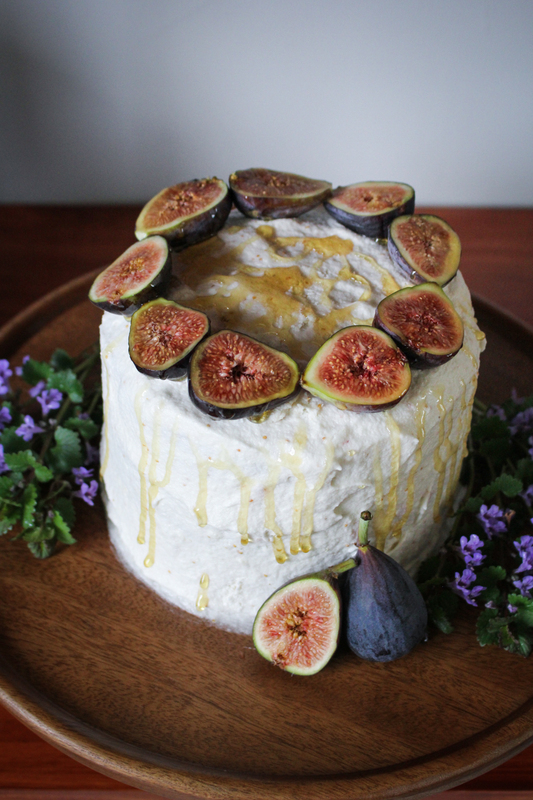 Top with fresh figs, sliced in half, and a drizzle of honey.